Our applicant Mel had a fantastic time at Anfield to watch Liverpool v Stoke. The family expressed the following “We are forever indebted to the David Randall Foundation and our ambassador, Neil. We applied to the foundation, following my Mum diagnosis of terminal cancer and her diagnosis was weeks, to short months. We had one request and that was to fulfill my Mum’s dream of watching her beloved Liverpool at Anfield. 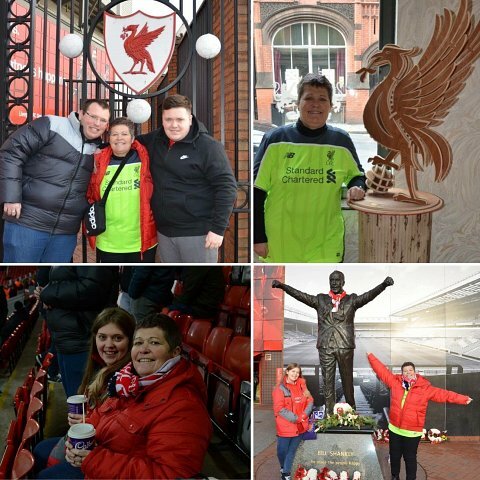 Within weeks, Neil had arranged for myself, my brother, my sister and our Mum to watch Liverpool vs Stoke on Tuesday 27 December… the best Christmas present ever, for my Mum and it would appear that Neil had completed the impossible! To top it all off, to my Mum’s surprise, Neil had arranged for us to stay at The Shankley Hotel the night before and it was absolutely stunning! And as a final gift, Liverpool managed to come from one-nil down and beat Stoke, by four goals to one.